The value of companies is traditionally estimated from the material wealth they hold. In the context of the knowledge economy (KE), these elements are no longer enough to estimate this value. Many authors are interested on new sources of value creation called immaterial. Nevertheless, the intangible elements, without physical or intangible substance, are difficultly taken into account by old accounting methods. The work done around our problem tries to define a model that reflects the overall performance of firms of the NE, by adding information about the intangibles to the old accounting data. The present study is looking for reliable measures of the performance of Tunisian firms which are operating in the new economy. The failure of accounting and financial data leads us to add other information. 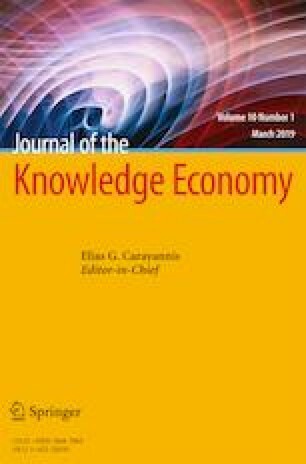 The pieces of information are related to intangible capital which is the main source of value creation for firms in the KE; however, they are ignored in traditional metrics. The results obtained, following the different operated regression, indicate the significance of the variables: “book value, BVE;” “return on equity, ROE;” and “return on assets, ROA.” However, the other ratios are insignificant. Furthermore, the explanatory power of the model is fairly low hovering around 20%. This result allows us to confirm the failure of classical accounting and financial data to translate firm performance of KE. Thus, we validated our initial hypothesis that stresses the usefulness of accounting and financial data in evaluating the performance of firms in the KE. Similarly, data on intangible capital is embodied in three aspects–structural, customer, and human–that play important roles in assessing this. The obtained results indicate that the explanatory power of the model, taking into account the intangible component, is higher than that based solely on the accounting and financial data. Indeed, adjusted R² lies in a range between 30 and 66%. This validates our second hypothesis on the role of intangibles in the chain of value creation. This study shows the important role of intangible capital information in the process of decision-making. Thus, investors and managers should give particular attention to immaterial components which allowed a better appreciation of the overall performance of Tunisian firms operating on NE. This is the contribution of our work. Such as MVE is the market value of the share, BVE is the book value of the share, NI is net income before extraordinary items, NEG_NI is net income before extraordinary items if this variable is <0 or equal; otherwise, it is set to 0, R&D are research and development expenses, ADVERT are advertising costs, CAP_EX is investment in property, and SALES_GR is a proxy for income growth. Kanjo Mantoh, R. (2015). “Intangible assets, firm performance and value creation :an empirical study of German public limited companies.” Aarhus University Business and Social Science: Department Of Economics and Business Economics. http://pure.au.dk/portal-asb-student/files/90835035/201302214.pdf. Tiras S., Ruf B. & Brown R. (1998). The relations between stakeholder’s implicit claims and firm value. www.ssrn.com. Yahchouchi, G. (2007). Valeur ajoutée par les parties prenantes et création de valeur de l’entreprise. La Revue des Sciences de Gestion, Direction et Gestion. Finance, 224–225. doi: 10.3917/rsg.224.0085.